When designing a modern bathroom that evokes the feel of a luxe private sanctuary to rid of the days stresses, it takes less effort and work on your part than you probably ever imagined. By keeping comforting simplicity and minimalism in mind, you’ll be on your way to creating a relaxing bathroom that you’ll never want to leave. To help inspire you, we turned to the trusted residential interior designers at Décor Aid for their sage advice and savvy decorating tips. After all, we all deserve to indulge and relax while never having to leave our homes. For a seamless and less visually busy feel, floating cabinets and shelving can make all the difference when wanting to soothe the eye. Bulky legs and platforms keep the space feeling closed off while floating cabinets are sure to make a bathroom feel less cluttered and busy, as floating units are often less imposing and obvious. Floating cabinets are also great if you have a small bathroom and want to ensure that the space appears larger with ease. Sure, white sounds like a basic starting point, but there’s something to be said about its timelessly refreshing appeal. A completely white minimal bathroom will make you feel more like you are relaxing in a luxury spa than bathing in your own bathroom. To break up the look, bring in different textures to allow the eye to keep moving. To create a soothing sanctuary of a bathroom, keep the feel calming and simple with gray, white or neutral tones and accessories like ultra-white plush towels. As when you add saturated pops of color and pattern in a small space, you’ll distract the eye, taking away from the comforting and relaxing private area you’ve meticulously created. It probably goes without saying that an oversized freestanding bathtub is the ultimate key to creating a bathroom that feels like a luxuriously comforting sanctuary. Even better when it features sauna-like jets and temperature controls. If you’re looking to invest in one, consider placing it right next to an expansive window so you can be comforted by the sensational view. Plants are calming, inspiring, and more importantly, they help to purify the air around you. Adding affordable and easy to care for plants in your bathroom will lend it an organic touch as well. Just be sure that you bring in plants that can survive and thrive in the trying conditions often found in a bathroom like steam and limited natural light. Aloe Vera and eucalyptus make for a terrific bathroom plant options as they boast low water requirements, meaning that the humidity of a bathroom might just cater to their needs. Bamboo is also another smart option as it doesn’t require much natural light. 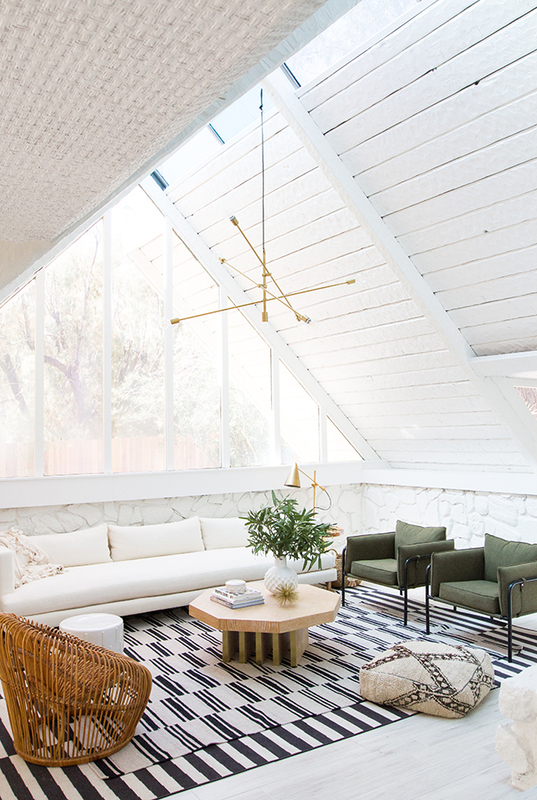 It’s amazing what natural light can do when it comes to energizing the spirit while helping to transform a functional space into a luxuriously relaxing one. If you have a window in your bathroom use it to your advantage to calm the senses by letting in as much natural light in as possible. Plus, natural light will make getting ready all the easier. But if it’s not possible, bring in lighting that mimics natural light as closely as possible. Reflect, reflect, reflect. Chic mirrors will instantly reflect natural light around your bathroom while helping to make it feel larger than it really is. Take a cue from luxe day spas and bring in mirrors featuring unique shapes and slim lines with a minimal spirit. Ladder shelving makes for a stylish way of displaying everyday accessories and necessities in your bathroom that you can reach with ease. Add an intoxicating scented candle, plants, and decorative items to complete the look and make the best use of the extra storage space a ladder shelving unit boasts. A pebble floor will add much-needed texture to any bathroom, and it will also be soothing and massaging to walk across. It’s also a great way to quietly add visual interest to the area while remaining timeless in style for years to come. You know those Fridays when you wake up and think it's Saturday?? Yeah that happened to me this morning. Well after two days stuck in bed fighting off my first cold of the season, I thought a round-up of some cool weather comforters and quilts seemed very appropriate as we start to break out some warmer bedding. So remember to turn those clocks back, open the windows, let the crisp air in and spend that extra hour in bed this weekend. Then maybe go treat yourself to a new quilt. It's the day after Halloween and I've already seen 3 Christmas commercials. Typical. As an adult I like to enjoy my holidays one season at a time and there's something to be said about savoring each season, enjoying the now instead of anticipating the next. Autumn is filled with so much deliciousness and beauty and I'll be relishing in all of it this month. When it comes to decorating our home, some predictable autumnal tones are shades of orange, yellow and red as seen in the change in foliage, but these colors can also feel commercial and may not work with your style. For me, I'm really feeling this warm, neutral palette, where subtle hints of nature are integrated into your existing decor for a look that will last all season and even transition into winter. (well maybe not the pumpkins). Creamy white pumpkins, sage green eucalyptus, sea glass vases and bowls, & crisp white mums enhance a neutral backdrop and look lovely contrasted with black accents and trims. I also love the unexpected look and tones of ornamental cabbage (also known as flowering kale) as seen below. 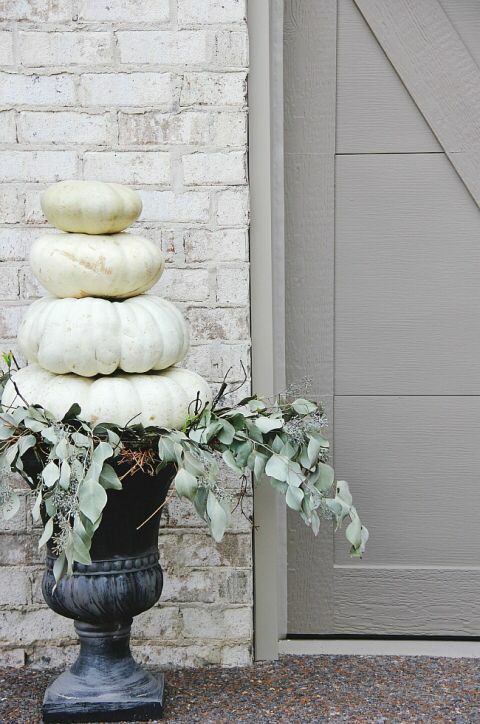 If you're looking for some subtle ways to cozy up your home, embrace the fall season or just need some Thanksgiving day decor ideas, I hope this post brings you some inspiration and reminds you to slow down, smell the mums, and enjoy the season to its fullest. 2017 may be coming to a close in two months, but I'm holding on to Pantone's Color of the Year Greenery and all its different shades. Freshly married with a re-signed lease, I'm looking for a few small ways to re-energize our Hell's Kitchen apartment and it's no wonder I'm gravitating towards shades of green. Green is a positive color and very inspiring in the way it represents growth, good health and balance in the home. The same things we also want in a marriage right?! Okay now let's talk about these (freakin' amazing) rooms. This look and color palette happens to work in my favor since the granite counter tops in our rental apartment kitchen (which extend into the living area) are greenish, something I've mostly been ignoring instead of embracing into the color scheme of the room. I could just DIE over the natural wooden floors and table against the white wood detailing and cabinets in this kitchen above. We also happen to own a vintage rattan armchair and some woven storage baskets which would tie in perfectly with this look and I'm thinking about switching out some of my patterned pillow covers on the sofa for more natural colored or white ones. Another thing all of these rooms have in common is the use of nature. I love how plants are quite literally the accent color in some of these rooms and you can feel the outdoors shining through in the form of natural sunlight, natural textures and textiles. So peaceful, so tranquil. I don't know about you, but all of these spaces are leaving me green with envy.